One of Stan Lee's most popular and enduring creations is The Incredible Hulk . The idea of being able to unleash your anger by transforming into a super-strong powerhouse is a great revenge fantasy. Stan Lee gets a lot of credit for conceiving of such a brilliant concept that taps into a collective idea. The truth, though, is that most people have never read the Incredible Hulk series from the beginning. I happened to get a digital collection of Hulk and was surprised by his original incarnation. In fact, after reading several issues, I came to the inescapable conclusion that Stan Lee had no idea what to do with the Hulk character at first. The premise of the Hulk changes radically over the first five issues. In the first two issues, things start out pretty much as we've always heard. Bruce Banner is changed into the Hulk due to a gamma bomb explosion. 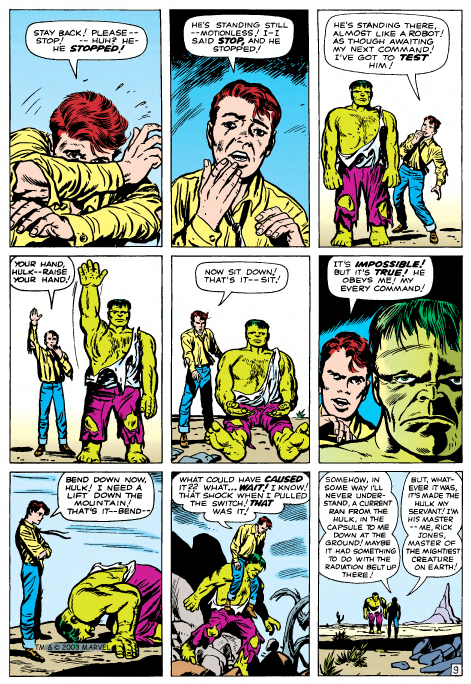 But in the first and second issues, the Hulk is gray, not green. 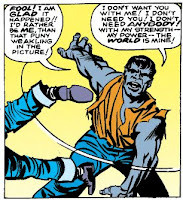 Hulk also can talk and has his own goal; to conquer the world. As if that weren't enough, Hulk's transformation is triggered by the day cycle, not emotion. During the day, he's Bruce Banner, but transforms into the Hulk at night. The idea was probably to make the Hulk like a werewolf, but the problem is that it makes Hulk predictable. In fact, Banner and Jones make a very smart decision. They build a huge bunker with a huge door and Banner locks himself into it at night, ensuring that Hulk can't get out to cause trouble. That may be why in issue three, a bizarre event occurs. As a way of getting rid of the Hulk, General Ross talks Rick Jones into luring the Hulk into a spaceship to blast him off Earth. He succeeds, and the Hulk is bathed in cosmic rays (Lee's old standby). When the Hulk crashes back onto Earth, Rick Jones tangles with the Hulk and discovers he's been profoundly changed. The Hulk no longer transforms back into Bruce Banner, and has become a mindless zombie that Rick Jones can control with his mind. I can just imagine Lee's editor going, "The kids aren't into that nerd, Bruce Banner. Rick Jones is the one they can really identify with. Let's make him the hero, instead." At this point, the Hulk becomes a sort of fantasy where Jones has a super-strong monster at his command. In issue three and four, the Hulk is Rick's slave, and Rick starts fighting super-villains by proxy. It's also where they start playing a little loose with the premise. 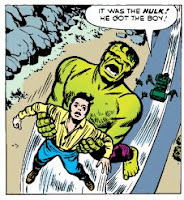 It's established early that Hulk can travel by jumping, but they cheat a little bit - Hulk changes direction in mid-air! That's not jumping, that's flying. Anyway, back to the story. At issue five, even this premise seems to get stale, because it changes radically again. Maybe the same editor says, "This doesn't work. Hulk is supposed to be the hero, not Rick. And what happened to Banner?" So Rick manages to turn Hulk back to Banner, who decides to expose himself to gamma radiation again. This transforms him back into the Hulk, except he now has the mind of Bruce Banner. Sort of. When he changes into Hulk, he's got this weird fusion personality where he's got the brains of Banner, the bad attitude of the Grey Hulk, and an accent like Bugs Bunny. It's the most bizarre change of all. Of course, the Hulk is still pretty awesome with his picking up tanks and bouncing bullets off his skin, so the character endured and eventually became the Hulk we all know and love. But it took a while to get there. What do you think of the Hulk's evolution? Want to know more about the Hulk's evolution in the next five two issues? Let us know in the comments! I had the first six issues in a pocket-sized, color collection when I was a kid. Oddly enough, when they reprinted it in the 70's or '80's they made him Green again in the first 2 issues - but a grayer green. Then a friend had a copy of Hulk #1`, and it was clear as (night?) that he was supposed to be gray. I kind of like that you ended this article here. To go over the Hulk's changes thru the decades would take forever - but I did like when they revisited the Gray Hulk before and during Peter David's run (drawn by Todd McFarlane - pre-Spidey, for the most part). If you continue this, it might be worth simply going over the Filmed adaptations of the Hulk, & how they compare to these first initial incarnations. Like, (for example) WHERE THE HELL IS RICK JONES IN ANY OF THE TV OR MOVIE VERSIONS OF THE INCREDIBLE HULK???!!! You're right, Django. Rick Jones is Banner's confidante and best friend in the comics, indespensible. But they've never used him in any of the adaptations. That's kind of weird. I mean, even Daredevil got Foggy.